If you haven’t watched this show yet, you’re really missing out on a lot of great tips on food, Style, and nutrition. The hosts of the show are Clinton Kelly ( From “What not to wear”), Mario Batali (Ciao America, Molto Mario and Iron Chef), Michael Symon (Iron chef), Carla Hall (Top Chef), and Daphne Oz (Door Room Diets, Health Corps and Nurtrition). This is not just your typical Cooking show. The hosts come up with a lot of different ideas. For example: Clinton shows how to turn one regular-size dish into an appetizer platter for at-home entertaining; he also shows how to make table designs for any kind of party or even some makeovers. Mario shows simple to make italian dishes. Michael creates a dish with five ingredients in five minutes or less at $5 or less per serving. Carla updates a dish from her family and something that failed in the kitchen and turns it into something that works. Daphne talks about nutrition and the effects of certain nutrients in human health and makes a favorite nutritious (and sometimes vegetarian) dish of the Oz family. They also have cooking segments with the guest of the day. This show really brings alot to the table airing everyday on ABC, check out your local tv guide for times. I had the opprtunity to be a part of the show yesterday in their special Viva Italia segment. I was one of the top 3 contestants who got to bring in a special recipe from my family. I brought in my Eggplant alla Norma dish, which is a tasty dish that I will post up the recipe to in the next post. Even though I did not win and didn’t have the chance to cook with Mario and Lidia Bastianich I still had and amazing experince. I got to meet the whole crew and Lidia as well, which let me tell you I was star struck with her. The other contestants dishes were amazing too. Just having Mario and Lidia try my food was a win win in its self. 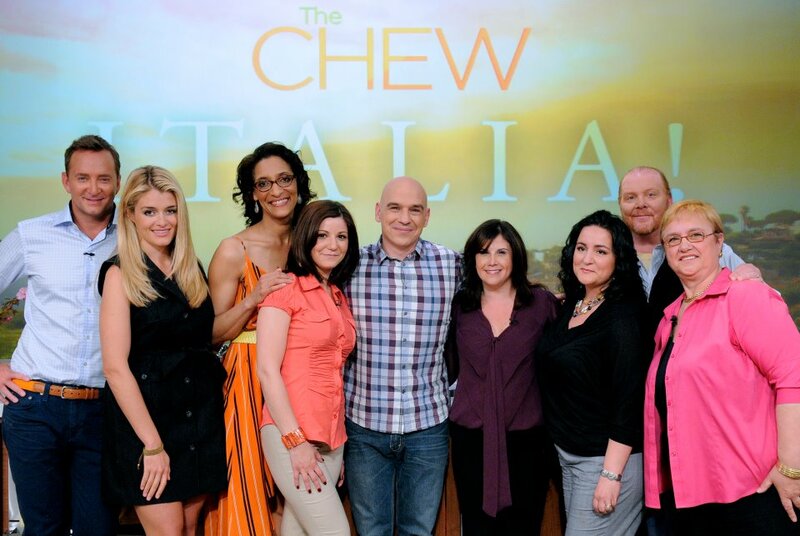 I hope to one day return to The Chew and get a chance to cook with Mario and the rest of the hosts. I really give credit to all the backstage team. They are amazing at what they do. Yes the show has all the celebrities, but it wouldn’t be there without all the amazing Producers, Make up , hair, designers, Kitchen Staff, Camera men, DJ, etc. Im glad that I had a chance to see all this. Wow, that is sooooo cool! Congratulations! I’ve heard of this show but hadn’t watched it. You did great on there as a contestant! I bet that was so much fun. I totally agree, they give super tips on the chew. I used their fake blood recipe for Halloween, and I’m headed to the grocery to get the ingredients for Carla’s cherry limeade! Really cool! Haven’t watched the show, but I’m sure it must have been a fabulous experience. Will try out your recipe. I am so impressed and honored that you would look at my blog. You are truly a cook extraordinaire! I will be checking in and trying your recipes on my family! Thank you for sharing your talents. Congrats! That is one fancy recipe. Looks amazing! Something to try on a very special date night or something. And, as is the greatest problem for any food blogger I’m sure…now I’m hungry. This is so exciting. Congratulations on winning. Just the excitement of being on the show would have had me tongue-tied — if that’s within the realm of realistic expectations. Some claim otherwise, but what do they know! 🙂 I enjoyed reading this, and if I’d been choosing, I would have chosen yours as the winner. Jes’ saying’ … thank you for sharing. I’ll be reading your blog for sure! Great site! I’ll be following your blogs, and enjoying them. My husband loves to cook, and I’m always on the lookout for new things for him to try. Like I told him when we met and got married, it was a match made by the LORD, cuz he liked to cook…and I liked to eat!